From this simple revelation, Joao constructed a natural dehydrator and tested it with fresh, peeled bananas. After just five days he had raw, organic, dehydrated bananas that tasted sweet and lasted for months. To their delight, Joao shared the organic bananas with his family and friends, but perhaps the biggest fan of all was his eldest son, Caue. In 2001, Caue relocated to Southern California to commence his career as a professional triathlete. The Suplicy family tradition of creating organic chewy bananas carried on, as Caue shared the banana superfood with his friends and fellow athletes across the country. After ten years of competing at an elite level, Caue retired from his professional racing career. In 2010, he decided to share the Super Potassium Snack ® with the world and embark on a journey that would soon become Barnana ®. We began our journey in Serra Do Mar Brasil to find the best organic bananas. Our Journey continued throughout South America until we found farmers who shared our belief of sustainable, organic whole foods. Equipped with the family secret, we set out to change the way the world snacks, one banana at a time. From humble beginnings in Southern Brasil to the headquarters in La Jolla, California, As the journey continues, Join us as we write our next chapter. Organic Coffee Chewy Banana Bites, a perfect morning energy boost, taking the popular breakfast duo of bananas and coffee and blending them into one, made with Fair-Trade organic Colombian roasted Arabica coffee beans. Non GMO, gluten free, kosher, and vegetarian the way nature intended. No additives, no preservatives, and sweetened by nature. Organic Apple Cinnamon Chewy Banana Bites, a twist on a classic Brazilian desert, combining sweet organic bananas, toothsome organic apples, and a pinch of spicy organic Ceylon cinnamon. 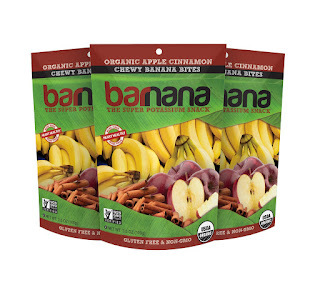 Barnana Banana Snacks are so delicious! I love that these are organic and easy to eat. Bananas are one of my favorite snacks so I really enjoyed these. 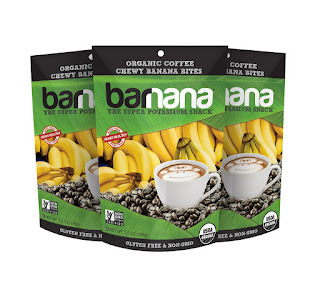 The organic chewy coffee banana bites are the perfect way to give yourself a little energy boost before heading into the gym because not only do they give you energy but you get all the wonderful benefits of eating a banana. Bananas are packed with potassium, which aids in maintaining nerve and muscle function. The Organic Apple Cinnamon Chewy Banana Bites are a great snack for after the gym for the same reason but I love these as an evening treat. The apple and cinnamon pairs nicely with the banana bites and the flavor is so good. If your looking to eat healthier, finding delicious healthy snacks are key and these are just perfect! Click HERE to view other varieties by Barnana. Follow Barnana on social media!